Draining the swamp of Leftarts corruption begins with stopping the voter fraud Democrats have been perpetrating for a century. So long as dead people and illegal immigrants are voting Democrat then Americans are in danger of losing their country. This election only proved that Democrat voter fraud is far more pervasive than those corrupt politicians in Washington will ever admit. They allow it to happen, just as they allow drugs to cross our borders, because they profit from it. Democrats are screaming that Trump won because Russia hacked the vote, but exposing the fraud of Hillary and the DNC rigging the primaries is not the same as Democrats stuffing the ballot box. Before the election, California’s Democrat governor announced he would allow illegal aliens to vote as if they were citizens. Virginia’s governor pardoned 60,000 violent felons, who can now legally buy guns, so they could vote and keep the state blue. Trump suggests that upwards of several million Democrat votes are fraudulent. The recount in Michigan that liberal idiot Jill Stein thought would help Hillary turned out to prove Detroit Democrat’s final tally exceeded actual votes. 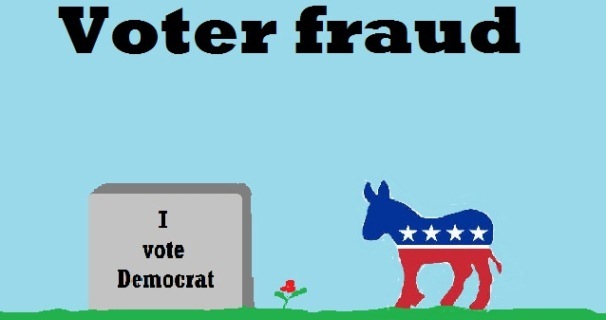 Democrats insist Hillary won the popular vote, but that’s meaningless since we are not a democracy, and more insidious in that Democrats are stuffing the ballot box with the votes of dead people, illegals, felons, and fraudsters. When it was reported in 2012 that Port St. Lucy, FL cast 46% more votes than they had registered voters, in a country where half of registered voters don’t bother to go to the polls, and they were all Democrat with not one Republican in the entire county, no one investigated! Democrats were happy, and the GOP was just as content to have TEA Party upstart Col. Allen West ousted. In another place an elderly black man was denied casting his ballot on Election Day because the polls show he had already voted and had been voting for years despite his stating he had never voted! This is the kind of fraud being perpetrated and these are just a couple of examples in a nation of 120 million votes. Our country was almost stolen from us by foreigners and parasites outvoting patriots. They do this through Democrat voter fraud that leaves no paper trail through rigged computers, pollsters that register dead people to vote, allow illegal aliens to vote, and themselves fill in fraudulent absentee ballots. Voter ID must be established wherein people must turn in a paper ballot with their thumbprint on it so there can be no fraud! Democrats fight this saying it’s too hard for minorities to get ID, but which none complain about when getting a driver’s license. If Democrats were righteous then they would insist on this investigation rather than trying to shut it down! Do voter ID laws suppress the black vote? The Religion of Climate Change Takes Another Hit from TrumpGreat Start Mr. President!